All I wanted to do was share a funny “Downton Abbey Meets Spike TV” skit that was on Saturday Night Live this week. 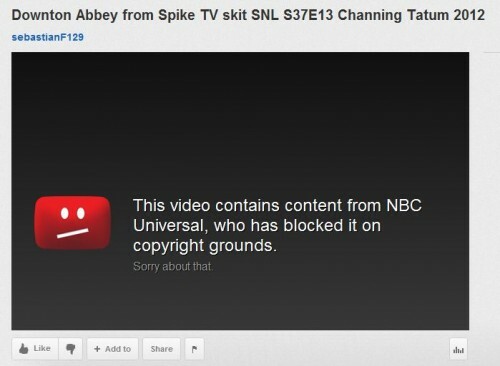 Unfortunately, there’s no authorized version of the sketch online from NBCUniversal. That made me hesitate, but apparently it wasn’t a problem for iVillage, an NBCUniversal-owned site. Nor was it an issue for Time, owned by internet piracy hating Time Warner. Come along. This is a sad tour of failure all around. 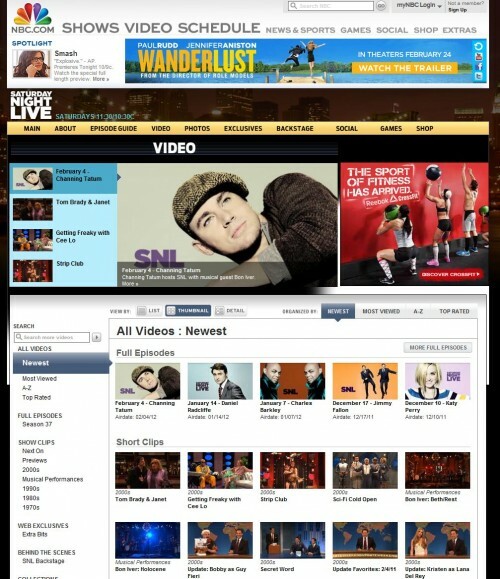 Full episodes of SNL consist of material that is cleared for online streaming. Some sketches and musical performances may be omitted due to various restrictions. As it turns out, the Downton Abbey skit appears to be one of those omitted sketches. I went through the episode that Hulu provides and couldn’t find it. There’s the skit! It’s not hosted by Time (of Time Warner) itself. Rather, it’s hosted on Google’s YouTube. Time is simply embedding the clip, on a page with Google ads at the bottom (those are the “Sponsored Links” that are showing). So Time is helping support the same type of unauthorized posting of content that its parent Time Warner is concerned about — and happy to blame Google for — and doing all this while earning some money from Google. Wait. iVillage is owned by NBCUniversal? You mean that NBCUniversal might be argued to have helped pirate itself? There’s the unauthorized video, embedded at the bottom of a story on an NBCUniversal web site. Hey, how about watching the skit as part of the full-length episode that NBC provides on its own site? It doesn’t appear you can do that, either. I’ve gone through it (and sat through the same “Star Wars: The Old Republic” ad about 10 times in doing so). That sketch doesn’t appear to be there. Why not? Apparently, it didn’t air on the West Coast — that might be part of all this. Another of those media outlets was owned by NBC/Universal, so effectively helped promote piracy of NBC/Universal’s own content. 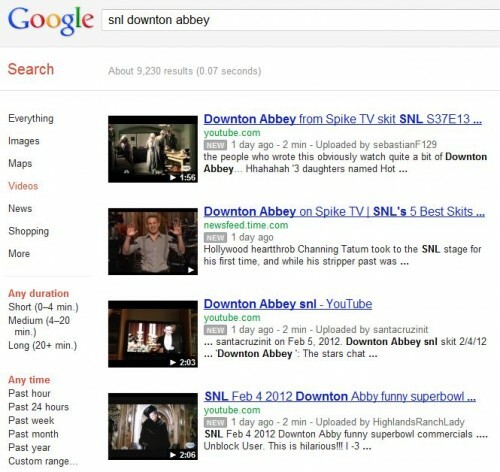 Postscript: See Why You Can’t See SNL’s Great “Game of Thrones” Sketch On NBC.com on AllThingsD for what likely happened to the SNL Downton Abbey skit — probably pulled over some rights issue. I did try for an answer from NBC, but they never answered.